The tar sands production center in northern Alberta in Canada is one of the clearest signs that the easy to get oil is on the wane. 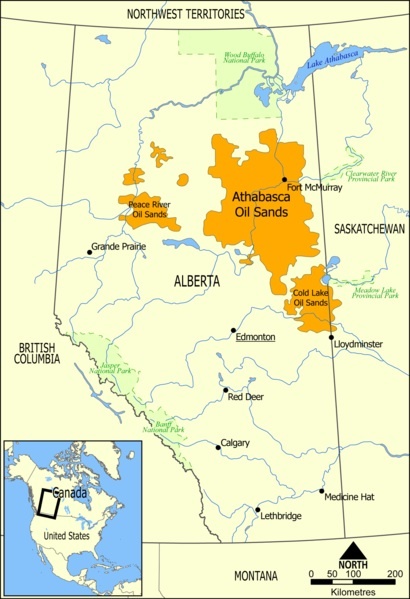 Tar sands are a low grade hydrocarbon deposit that requires enormous energy input to process and convert it into something resembling petroleum. They are not technically petroleum, but a sludge that can be turned into petroleum if washed and cooked with steam (which is not an abundant natural resource in the boreal forest of northern Alberta, especially during the Canadian winter). Turning tar sands into oil requires almost as much energy input as they contain at the end of the processing - so they are barely a "source" of energy. To date, vast quantities of natural gas have been used to make the steam to process the tar sands to create something resembling petroleum, but natural gas has its own supply problems that make dedicating gas to tar production difficult to maintain. There are serious proposals to build nuclear reactors next to the tar sands, which is a sign of lunacy, to be polite about it. Tar sands extraction causes enormous ecological destruction. The process begins with clearcutting the boreal forest, destroying habitat and soil. The trees are either milled into lumber, which releases some of the carbon into the atmosphere, or the trees are burned as slash, which releases nearly all of the carbon into the atmosphere. The carbon reserves locked up in the forest soils are also released into the atmosphere. After the land is cleared, the "overburden" subsoils and rock are strip mined using enormous dump trucks the size of a house. Eventually, the mine reaches the layer where the tar sands congealed eons ago, and then the tar sands are mined. 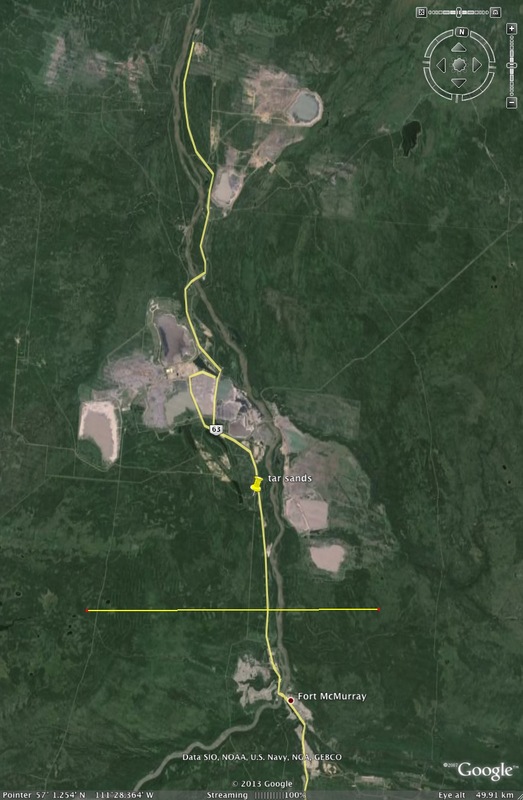 It is possible that the tar sands are the single largest strip mine anywhere on Earth. The waste "tailings" left over when the mining is finished are a toxic slurry that is poisonous to life. In addition to huge amounts of energy, vast quantities of water are also needed in the tar sands industry. While Canada has more water than any other country -- it is the Saudi Arabia of water -- polluting the planet's largest supply of fresh water for a short term burst of energy production is one of the most insane behaviors imaginable. After the era of fossil fuels winds down, and the era of climate change starts up, access to clean drinking water will be unbelievably important. Tar sands production threatens to turn much of central Canada's water reserves into oily wastes unfit for consumption. Perhaps the saddest aspect of the rise of the tar sands industry is that all of this destruction is only expected to supply a small amount of the demand for oil. In 2007, about one million barrels per day of tar sands is produced in Alberta -- about one percent of the global consumption of about 85 million barrels per day. 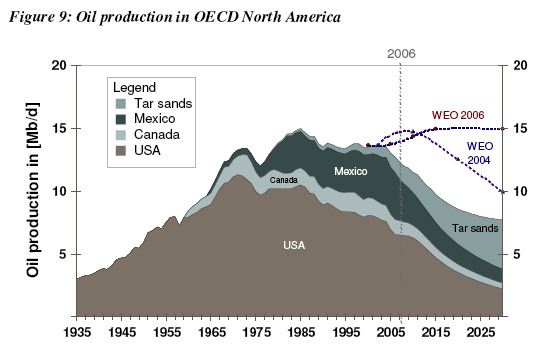 It is predicted that with considerable investment, Canadian tar sands production might reach a couple million barrels per day within a decade. This means that an area the size of Florida will be totally deforested, strip mined, drained of clean water, and doused with toxic effluent to meet a small percentage of global oil demand for a couple of decades (at best). A reader of this website suggests that the rush to mine tar sands resembles an indigent cigarette addict looking through ashtrays to find a couple of butts that can be relit to get a couple final (nasty tasting) drags of tobacco smoke. This is a book review of Tar Sands: Dirty Oil and the Future of a Continent, 2010 edition, 280 pages, by Andrew Nikiforuk. BP, the British oil giant that pledged to move “Beyond Petroleum” by finding cleaner ways to produce fossil fuels, is being accused of abandoning its “green sheen” by investing nearly £1.5bn to extract oil from the Canadian wilderness using methods which environmentalists say are part of the “biggest global warming crime” in history. The multinational oil and gas producer, which last year made a profit of £11bn, is facing a head-on confrontation with the green lobby in the pristine forests of North America after Greenpeace pledged a direct action campaign against BP following its decision to reverse a long-standing policy and invest heavily in extracting so-called “oil sands” that lie beneath the Canadian province of Alberta and form the world’s second-largest proven oil reserves after Saudi Arabia. Producing crude oil from the tar sands - a heavy mixture of bitumen, water, sand and clay - found beneath more than 54,000 square miles of prime forest in northern Alberta - an area the size of England and Wales combined - generates up to four times more carbon dioxide, the principal global warming gas, than conventional drilling. The booming oil sands industry will produce 100 million tonnes of CO2 (equivalent to a fifth of the UK’s entire annual emissions) a year by 2012, ensuring that Canada will miss its emission targets under the Kyoto treaty, according to environmentalist activists. The oil rush is also scarring a wilderness landscape: millions of tonnes of plant life and top soil is scooped away in vast open-pit mines and millions of litres of water are diverted from rivers - up to five barrels of water are needed to produce a single barrel of crude and the process requires huge amounts of natural gas. The industry, which now includes all the major oil multinationals, including the Anglo-Dutch Shell and American combine Exxon-Mobil, boasts that it takes two tonnes of the raw sands to produce a single barrel of oil. BP insists it will use a less damaging extraction method, but it accepts that its investment will increase its carbon footprint. Mike Hudema, the climate and energy campaigner for Greenpeace in Canada, told The Independent: “BP has done a very good job in recent years of promoting its green objectives. By jumping into tar sands extraction it is taking part in the biggest global warming crime ever seen and BP’s green sheen is gone. “It takes about 29kg of CO2 to produce a barrel of oil conventionally. That figure can be as much 125kg for tar sands oil. It also has the potential to kill off or damage the vast forest wilderness, greater than the size of England and Wales, which forms part of the world’s biggest carbon sinks. For BP to be involved in this trade not only flies in the face of their rhetoric but in the era of climate change it should not be being developed at all. You cannot call yourself ‘Beyond Petroleum’ and involve yourself in tar sands extraction.” Mr Hudema said Greenpeace was planning a direct action campaign against BP, which could disrupt its activities as its starts construction work in Alberta next year. The company had shied away from involvement oil sands, until recently regarded as economically unviable and environmentally unpleasant. Lord Browne of Madingley, who was BP’s chief executive until May, sold its remaining Canadian tar sands interests in 1999 and declared as recently as 2004 that there were “tons of opportunities” beyond the sector. But as oil prices hover around the $100-per-barrel mark, Lord Browne’s successor, Tony Hayward, announced that BP has entered a joint venture with Husky Energy, owned by the Hong Kong based billionaire Li Ka-Shing, to develop a tar sands facility which will be capable of producing 200,000 barrels of crude a day by 2020. In return for a half share of Husky’s Sunrise field in the Athabasca region of Alberta, the epicentre of the tar sands industry, BP has sold its partner a 50 per cent stake in its Toledo oil refinery in Ohio. The companies will invest $5.5bn (£2.7) in the project, making BP one of the biggest players in tar sands extraction. 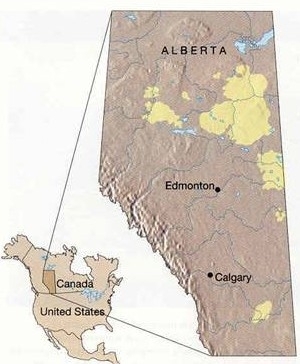 Canada claims that it has 175 billion barrels of recoverable oil in Alberta, making the province second only to Saudi Arabia in proved oil riches and sparking a £50bn “oil rush” as American, Chinese and European investors rush to profit from high oil prices. Despite production costs per barrel of up to £15, compared to £1 per barrel in Saudi Arabia, the Canadian province expects to be pumping five million barrels of crude a day by 2030. BP said it will be using a technology that pumps steam heated by natural gas into vertical wells to liquefy the solidified oil sands and pump it to the surface in a way that is less damaging than open cast mining. But campaigners said this method requires 1,000 cubic feet of gas to produce one barrel of unrefined bitumen - the same required to heat an average British home for 5.5 days. Licenses have been issued by the Albertan government to extract 350 million cubic metres of water from the Athabasca River every year. But the water used in the extraction process, say campaigners, is so contaminated that it cannot be returned to the eco-system and must instead be stored in vast “tailings ponds” that cover up to 20 square miles and there is evidence of increased rates of cancer and multiple sclerosis in down-river communities. Canada home to global warming's new ground zero. You can't practice abstinence while running a brothel. Yet politicians of almost all stripes talk simultaneously about developing the Alberta oil sands while getting serous about reducing carbon emissions. Sound like a crock? It is. Beyond arcane terms like "emissions trading" and "carbon credits," climate change is actually very simple: Every time we extract ancient carbon out of the ground and burn it we are making climate change worse. The more you burn, the worse it gets. Bearing in mind that simple truth, how much extractable oil is in the Alberta oil sands? That is one area where industry and environmentalists agree. It's a lot -- about 175 billion barrels. That is second only to the oil reserves of Saudi Arabia. Beyond this massive storehouse of ancient carbon, the additional problem with the oil sands is that is takes a colossal amount of energy to extract and refine the extremely low-grade tar deposits that cover more than 20 per cent of the Alberta landmass. 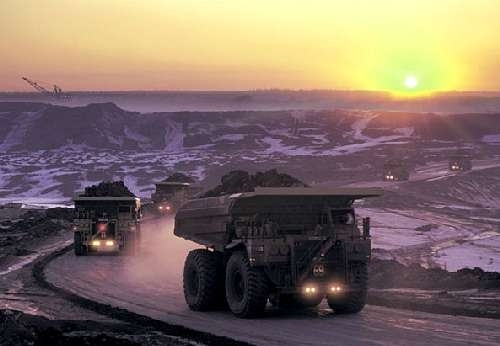 The oil sands are mostly rock and sand -- only 12 per cent is bitumen. This tar must then be upgraded at enormous energy cost to synthetic crude. That process consumes about 700 million cubic feet of natural gas each day -- enough to heat over 3.7 million Canadian homes. That massive waste of finite and comparatively clean natural gas is expected to triple in the next eight years. Left unfettered, Alberta's energy sector will, by the end of this century, transform the southern part of the province into a desert and its north into a treeless, toxic swamp. Driven both by global warming and oil and gas developments, temperatures in Alberta will soar by as much as eight degrees. The Athabasca River will slow to a trickle, parching the remainder of the province's forests and encouraging them to burst into flame, generating vast quantities of CO2. "They're going to be the architects of their own destruction," says journalist William Marsden, whose new book outlines the environmental threats posed by Alberta's energy industry. Even now, fish pulled from the Athabasca downstream of the oil sands taste of gasoline and smell of burning galoshes in the fry pan. The landscape is perforated by more than 300,000 oil and gas wells. Water in some areas to the south can be set alight with a match, likely due to coal-bed methane developments. Doctors administering to Aboriginal communities not far from the oil sands report high rates of thyroid conditions and rare diseases such as cancer of the bile duct. Some from those communities have been employed at the oil sands raking in the carcasses of ducks floating on vast pools of rotten water, the by-product of the sands' oil-extraction methods. Such are the claims contained in Marsden's upcoming Stupid to the Last Drop: How Alberta is Bringing Environmental Armageddon to Canada (And Doesn't Seem to Care), which presents a scenario almost too frightening to contemplate and suggests Alberta may already be too far gone for redemption -- indeed, that it is environmentally doomed. "When you start digging up an area equivalent to the state of Florida, when you start carpet-bombing your province with oil and gas wells, and at the same time, you've got global warming drying up the glaciers and your rivers -- you're kind of looking at a doomsday scenario," he says. "It sounds bizarre, but it's an absolute possibility that they could be literally destroying themselves." Marsden argues Alberta's political leadership has consistently neglected -- in an almost willful, pathological way -- to curb the destruction wrought by industry. Former premier Ralph Klein for years rejected placing controls on Alberta's energy sector and, according to Marsden, ordered the dismantling of oversight bodies that might have monitored the degradation, the extent of which remains somewhat unclear today as a result. Marsden charges the province with marginalizing scientists who sound warnings on the environment, quoting Rod Love, Klein's long-time chief of staff, dismissing them as "flakes." The book is bound to enrage Alberta and its energy sector. "Why are Albertans so stupid?" Marsden asks an Alberta scientist at one point in the book. Designed to be provocative, Stupid to the Last Drop will come under intense fire as an exercise in fearmongering and West-bashing by a Montreal journalist. Yet it will be applauded by others who fear that the environment gets short shrift in Alberta. "I think it's useful to have books like that -- it scares people, I guess," says David Keith, an expert on carbon capture at the University of Calgary. Still, the fight Marsden is picking with Alberta may be a harbinger of a more titanic one to come. Alberta has become the country's economic engine -- churning out money at the same time it spews huge emissions -- and the rest of Canada, whether out of jealousy or genuine concern, may soon demand environmental controls be placed on the province, the country's worst industrial greenhouse gas emitter. Experts, from constitutional scholars to former Alberta premier Peter Lougheed, are predicting a battle, and at the centre of that coming feud is the issue of how far the federal government can go in controlling a resource Alberta owns. It's a fight some fear may tear Canada apart. Known mainly for his reporting on organized crime in Canada, Marsden has written a polemic on the Alberta environment that looks at first blush to be a departure. Marsden disagrees. "Frankly, I think what's going on in Alberta is a crime," he says. "You get these kinds of political factions and gangsters, almost, who have literally taken over a province -- and are reducing it to catastrophic shape." The riches generated by Alberta's energy sector are astounding, the stuff of breathless business stories and promises by the likes of Prime Minister Stephen Harper that the province is on the cusp of becoming an "energy superpower." Earlier this year, Calgary-based EnCana earned profits of $6.4 billion, a record-breaking sum. The provincial government's last budget showed a surplus of $8.5 billion. So dynamic is Alberta's energy boom that it's become, what with Ontario's struggling manufacturing sector, the real power in the economy. Remove Alberta from the Canadian economy, some say, and the country would now be in recession. There is no denying, however, that the wealth comes at a huge environmental cost. In a rollicking, wry style, Stupid to the Last Drop outlines that environmental degradation, as well as the energy industry's appetite for wild schemes. Marsden dredges up, for example, a little-known plot hatched by an American geologist in the late 1950s to free oil from the tar sands by detonating a nuclear device beneath an Alberta creek, a plan that came surprisingly close to execution. And yet, Marsden argues, what is going on right now is almost as outrageous. Consider the millions in cubic metres of water that three oil sands projects -- 20 more are in the works or pending approval -- extract from the Athabasca River each year. The water, which in heated form is used to melt the bitumen free of the sands, is crucial; between two and six barrels of water are required to produce a single barrel of oil. Oil sands outfits are sucking 215.2 million cubic metres of water a year, Marsden writes, and are now licensed to draw 349 million cubic metres of water a year, twice what's required for the city of Calgary. Extractions from the Athabasca could triple in the next decade. As a result of both global warming, which is melting the mountain glaciers that nourish Alberta's waterways, and oil sands extractions, flow in the Athabasca has been reduced by 30 per cent since 1970. By 2020, the oil sands could use as much as half the river's flow in winter, a time when it is at its lowest ebb and fish populations are most stressed. At such levels, says the Pembina Institute's Chris Severson-Baker, "You run the risk of killing the ecosystem." More, Marsden cites scientific research that suggests the 20th century was unusually kind to Alberta in water terms -- a desert in its south is a real possibility, he says -- and warns that industry may be taking advantage of a natural anomaly. Alberta's oil sands operations also struggle with the problem of what to do with the water once it's been used. Only eight per cent can be made sufficiently clean to go back to the Athabasca. The rest stagnates in huge ponds. "Birds that land on them never take off," David Schindler, an ecologist at the University of Alberta, told Maclean's. Oil sands operators now float buoys in the ponds equipped with hard-hat-wearing scarecrows and propane cannons, whose booming sounds are designed to prevent the water fowl from landing. Consumption of natural gas, another critical oil sands ingredient, also boggles the mind. By the end of 2005, the industry's daily consumption could heat 3.2 million homes for a day. Marsden notes that present consumption could triple in the oil sands by 2015. Environmentalists have long decried the absurdity of wasting such huge quantities of reasonably clean energy to extract dirtier oil. Then there's the question of greenhouse gas emissions. The Sierra Club of Canada says oil sands operations spewed 23.3 megatonnes of them in 2000 -- about three per cent of Canada's total emissions. Those emissions are predicted to rise to between 57 and 97 megatonnes by 2015, making the oil sands Canada's largest single contributor to global warming. The University of Calgary's Keith says the province is responsible for roughly 36 per cent of Canada's CO2 emissions, though most originate in the electrical power industry (the most significant emitters of any industry countrywide). Alberta, Keith points out, is "only 11 per cent of the population -- it's pretty asymmetric." The projects are at the same time decimating Alberta's northern boreal forest, which forms an umbrella above a vast, metres-thick deposit of peat, a carbon sink that begins bleeding CO2 into the atmosphere upon excavation. "The boreal forest per unit area actually contains more carbon than the Amazon does," Schindler says. Adds Severson-Baker: "The public has been really focused on the critical role of the tropical rainforest, but the boreal forest plays a similar role" in regulating the earth's climate. The remainder of the boreal forest will soon become a tinderbox of forest fire activity due to a global warming-related pine beetle infestation and an increasingly dry Alberta, Marsden says. The Canadian Forest Service says global-warming models show the area burned by forest fires will double over the next century. High forest fire years already spew emissions equal to 90 per cent of industrial emissions, says Schindler. It's a startling litany of environmental abuse. But some in Alberta point out that the province has already begun meeting these challenges by bringing in green legislation earlier this year more stringent than federal law. Others believe Marsden's "Armageddon" won't happen because industry will become cleaner through innovation. "We have a history of meeting those challenges," says Calgary-based Annette Hester, of the Centre for International Governance Innovation. "If it wasn't for meeting those challenges, we would never have an oil sands development in the first place." 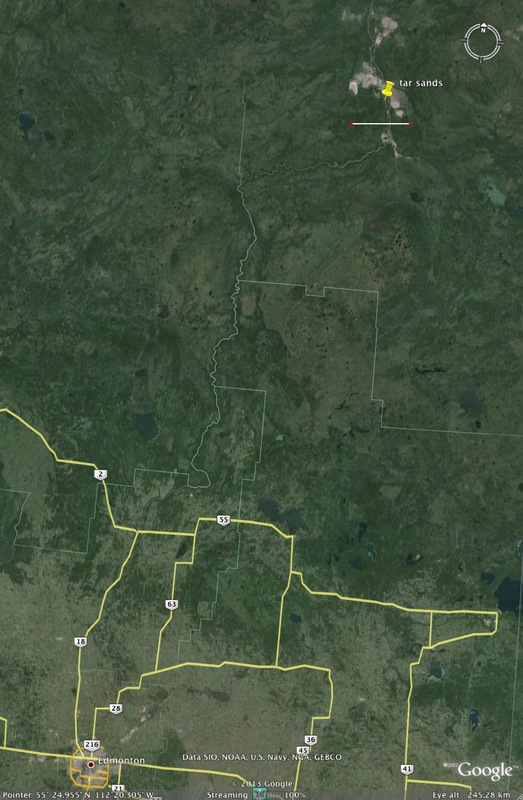 Oil sands outfits are required by the province to plan for land restoration. And cleaner and more efficient practices -- carbon sequestration that buries CO2 or nuclear power as a replacement for natural gas -- are in the offing. Nor does Keith believe doomsday scenarios like those presented by Marsden. Though effects like an eight-degree rise in temperature -- one potential outcome included in the book -- are possible, "that prediction is contingent on people's choices," says Keith. "My actual prediction is, we won't get close to that." He adds: "Do we have serious environmental problems? Of course. Is it true that eventually we will have to close down the entire industry here -- the entire industry of producing oil for putting in cars -- because of environmental concerns? At some level yeah. Is there going to be a desert? No." But Marsden believes the future he describes should persuade Alberta to halt further oil sands developments. "I think that you have to put a moratorium on any further growth in the oil sands until that province really figures out where it wants to go," he says. "Then the people of the province -- and the people of Canada, too, because these are vital resources for all of Canada -- can decide how they want to proceed on this." Although such a suggestion may be blasphemous to some -- particularly in Alberta -- no less a figure than former premier Peter Lougheed has called for a slowdown, in part to study how the oil sands developments are effecting the environment. Marsden has another point to make. Driving the breakneck pace of Alberta's oil boom, he says, is Canada's commitments to the U.S. under the North American Free Trade Agreement, which he says promises the U.S. an inordinate amount of our oil. Marsden, in effect, argues Canada has sold its soul. "We have ourselves in a corner over NAFTA," says Marsden, "because we've surrendered sovereignty over our energy." Stupid to the Last Drop has Lougheed, who helped negotiate NAFTA, predicting that the U.S. will manhandle Canada fiercely should China or India, say, make grabs for a share of the sands. Paraphrasing Lougheed, he writes: "Alberta under Ralph Klein ... essentially surrendered its control over its resources to the free market, and the Americans have walked in and taken control." Now Alberta's resource-development surge has put it on a collision course with central Canada's devotion to Kyoto. Lougheed, who predicted this clash of interests in a speech last month in Calgary, warned that Canada's very national fabric could be threatened when Alberta's desire to exploit its resources conflicts with any renewed federal government push to regulate them. That push almost arrived last October, not long after the Tories introduced Bill C-30, which aimed to introduce a bundle of new air pollution regulations. The original bill made no mention of the Kyoto Protocol and its target for cutting greenhouse gas emissions dramatically, six per cent below 1990 levels by 2012. Instead, the Tories sought to limit emissions by 2020. But when the bill was handed over to a House committee, opposition party MPs overwhelmed the Tory minority, drafting sweeping amendments. Not only did they enshrine the Kyoto targets, they also detailed an enforcement system for stringently regulating emissions-heavy sectors of the economy. The Tories tout their own plan, unveiled by Environment Minister John Baird last spring. But Baird's greenprint, which is a broad strategy rather than a law, doesn't come close to the hard-nosed approach in the opposition's overhaul of C-30. Although he calls for major industries to shrink emissions by 60 megatonnes in 2020, from 350 to 400 megatonnes now, he doesn't say how. And critics scoff at the plan's reliance on so-called "intensity" rules, which require industries to burn fossil fuels more efficiently yet allow their total carbon dioxide output to grow if overall production also rises. Should Alberta ever confront more severe legislation -- anything with the same flavour as the opposition MPs' C-30 rewrite -- the feds would have a fight on their hands. "My surmise is that we're into this constitutional legal conflict soon," Lougheed said last month, adding: "National unity will be threatened if the court upholds federal environmental legislation and it causes major damage to the Alberta oil sands and our economy." That battle would also pit province against province in a way not seen since the days of the National Energy Program. "The tensions," says Thomas Courchene of Queen's University, "are magnified by what's called the Dutch disease," a concept in economics that holds energy exports -- such as those from Alberta -- appreciate the dollar, "which then clobbers central Canadian manufacturing. So there's this tension between the oil sectors and manufacturing." The main players in this feud are Alberta and Ontario, with its ailing auto manufacturing industry. Hints of the tensions could be seen in the ramp-up to a premiers' meeting last month, when Premier Ed Stelmach told his counterparts not to "mess with Alberta. Alberta's boom is Canada's boom." With the provinces at odds, the feds can't afford a constitutional battle, which might take place if stringent federal legislation triggers a provincial court challenge. The threat is not a new one. Ralph Klein warned of a challenge 10 years ago, just days before federal officials flew to Kyoto and committed to international emissions caps. The threat is serious. The Constitution clearly gives the provinces "exclusive" rights over the exploration, development and management of their natural resources. The question is what that would mean to a federal government seeking to regulate emissions. Constitutional law experts are divided on the issue. While Canadian courts have in the past been clear in ruling which jurisdiction prevails in environmental matters, deciding in favour of the feds, its hard to know just how far the courts will go. A 1997 Supreme Court decision upheld the federal government's right to sanction polluters under criminal law, a decision that stemmed from a court challenge launched by Hydro-Québec after it had been criminally charged for dumping PCBs. The University of Ottawa's Stewart Elgie, who helped argue the Hydro-Québec case, says the decision makes it "very likely that the federal government has the constitutional power to bring in tough environmental laws." Al Lucas, dean of law at the University of Calgary, is less certain. "If you read the Hydro-Québec case, it looks like the feds can do anything they want as long as they set it up as a criminal offence," he says. "But there have got to be some limits to that because, carried to its ultimate limits, federal authority just gobbles up everything provincial." Lucas says the Supreme Court would likely have to set these limits in any future provincial challenge to federal environmental legislation. Where those limits might fall is an open question. That may be why the Tories have yet to move on Baird's plan -- they may be waiting to see if they can work things out with Alberta and avoid a national maelstrom that could pull in the other provinces. Still, Alberta should brace itself. Sooner or later, its energy sector will have to change. "Albertans aren't in the driver's seat here," says Keith. "They'll be regulated over. And not necessarily by Ottawa." He argues many environmental initiatives will be forced by market conditions set by carbon regulations south of the border, like those California Governor Arnold Schwarzenegger is seeking. What Keith and others are awaiting is the hosanna of a "tipping point" in public and government attitudes that will force regulations -- the same kind of pressure that led to action on ozone-destroying chlorofluorocarbons, for example, or the pesticide DDT. And when those regulations do arrive, says Courchene, "they're going to be viewed by the Canadian public in the same way as the Canadian Health Act principles are" -- in other words, as a core Canadian value. "And they're going to force all provincial governments to toe the line."